The Samsung Galaxy Tab is a compact tablet computer with phone that running Android 2.2 operating system, and is one of the popular highly portable mobile multimedia and entertainment device.As a phone, it allows users to do voice calling and video calling, in addition to usual SMS texting. The main power of Samsung Galaxy Tab is the highly open applications ecosystem where virtually any type of apps can be found from Android Market. By rooting the Samsung Galaxy Tab, the device is opened to more advanced applications that able to make the tablet even more powerful. Root access gives user the full access and complete control to the system on the phone. After the Galaxy Tab is rooted, user can perform actions such as uninstall and remove system apps, install root-only apps, do complete Nandroid backups, flash custom ROMs, apply themes, change boot animations and etc. There are many ways to root the Galaxy Tab, but the easiest and simplest method is probably a one-click root app called z4root. Another method to root the Galaxy Tab is by using SuperOnceClick (works for almost all phones and all android versions), which runs on desktop computer and root the Galaxy Tab over USB connection. On Galaxy Tab device, press the Menu button, and then tap to Settings -> Applications -> Development -> USB debugging to enable USB debugging. 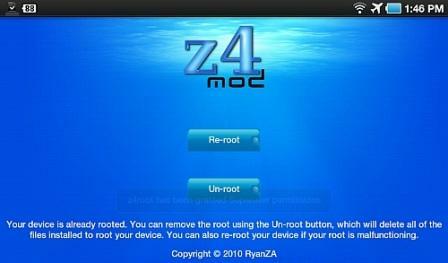 Run z4root and press the Root button. Your device is already rooted. You can remove the root using the “Un-root” button, which will delete all of the files installed to root your device. You can also re-root your device if your root is malfunctioning. An new app called Superuser will also be installed automatically upon rooting. Samsung Galaxy Tab is fully rooted. Download and install Samsung Kies and PC Sync software from Samsung Mobile. Connect the Galaxy Tab device (with debugging mode disabled) to computer, and sync with Kies once. Connect the Galaxy Tab to PC again, and click on Home button so that Tab comes out of Kies connection. Click on root and wait for 5 to 10 minutes. The Galaxy Tab should be rooted after the process is completed.